"Rain or shine, a great day out"
What a brilliant day out - rain or shine you really can have a great day at Look Out! Its fun; it’s educational; it’s indoor and outdoor; it’s brilliant for all ages and basically each time you go you are bound to see or discover something new! There are 1,000 hectares of managed woodland (all owned by the Crown Estate) so a tramp through the trees is great fun. There are also nature trails, suggested walks and a thrilling high wire course. Even the wooden outdoor play areas are top of the range with specified areas for different ages. 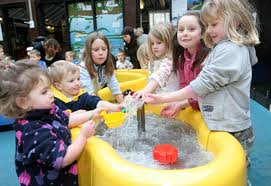 Inside there are some clever hands-on science exhibits to pull, splash, tap, squeeze and tickle! Toddlers will love the water rapids and the miniature shop complete with shopping baskets, working tills and piles of food to sell. And, there's a soft play area with ball pit, reading corner and a foot operated piano to try out. The Coffee Shop is as good as you can expect. They were brilliant when our little one fell and hit her head: dashing out with dry ice packs for her and a cup of tea for me! Best thing: Outdoor areas are vast and free!